© Catherine Murphy. Photograph by R.H. Hensleigh..
Catherine Murphy’s work has always expressed both her acute perceptions of her personal world and her sense of the geometries underlying its ordinary objects and places. 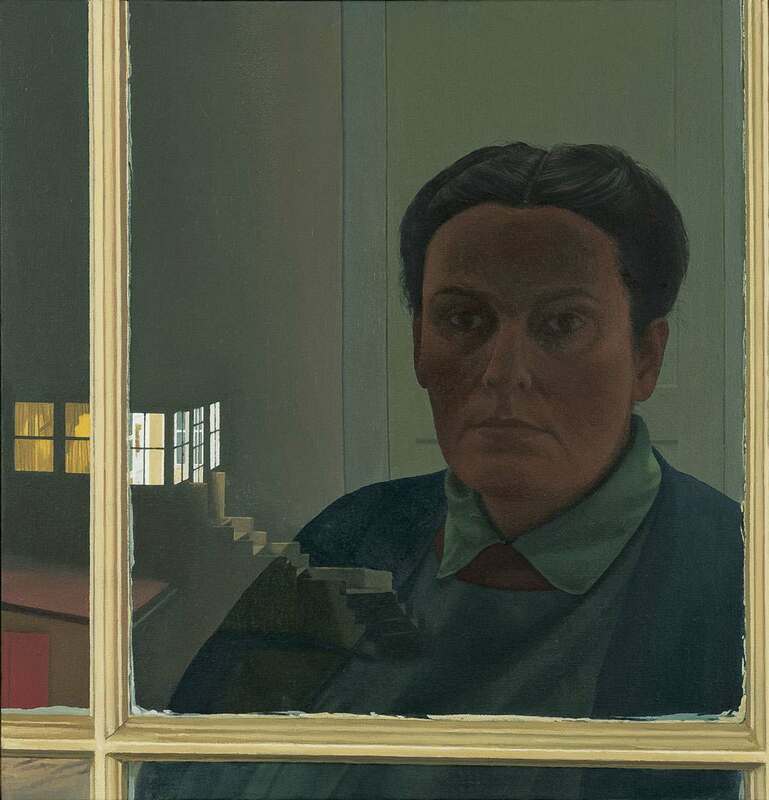 Nighttime Self-Portrait shows the view seen by the artist looking through a nighttime upper window of her house at an outside porch entrance, which intersects with the dim reflection on the glass pane of her face, shoulders, and a bit of interior door and wall. The mullions of the interior window frame are rendered with such illusionistic care that they seem to protrude into our space. This transforms the window’s surface into the picture plane. Catherine Murphy’s reflection places her on “our” side of the picture plane, while through the window “in the picture” lies an assembly of cubic steps and building parts. In an early exhibition, Murphy hung three works together as Garden of Eden Trilogy, a narrative constructed for the show “about the apple and how Eve, in eating it, gave us all self-consciousness. Without self-consciousness, there would be no art.” In Nighttime Self-Portrait, the translucent veils through which we see into the rear room of the exterior structure recall an early comment by the artist about being “a watcher behind curtains.” Here the painter observes an unpeopled part of her domain from a perch high in her home. Self-portrait details of clothing and physiognomy are rendered with a fine brush, but dulled to capture the mysterious quality of a nighttime reflection. Our attention is caught by the off-axis framings of the crisply-focused window mullions, which are echoed by the dim verticals of the door jamb behind her figure, and counterpointed by the showy illuminated cascade of shapes in the yard below.